With Jhudora Day close at hand, it makes all of us Neopians think of the good times we have had with Jhudora, and why we simply love her so much. Where would the free Neopian world be today without her? To help us all ponder why we love her dearly, I have composed a list. Ten reasons we love Jhudora... enjoy! 10) She handles criticism well- Although Jhudora is known for being "evil", what has she really done? The answer is nothing at all. There is much talk of how bad Jhudora is, but no one has any proof for these accusations. Isn't the rule innocent until proven guilty? I see no harm done by a faerie sitting on a cloud. Illusen should be ashamed for those rumors she has spread! If all your faerie friends talked about you behind your back, you would be a little cranky too, or maybe dark perhaps? I am sure all the psychiatrists are giving her a hand right now for her emotionally stability. 8) She provides shade for Neopia- As stated above, Jhudora spends her time on a purple cloud. Clouds provide shade when the heat of Neopia is just too much to bear. This must really help on a scorching day in the Lost Desert. Perhaps her cloud goes floating over Brightvale; all that reading is hot work! If she were really an evil villain, she would live on a giant meepit. A meepit who spits upon any Neopian traveling near. 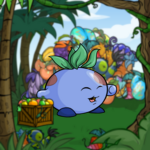 That is really loving of her not to have meepits spitting on us; thanks, Jhudora! 7) She encourages reading to children- I have numerous reports of Jhudora reading to children at our local Neopian book shop! If that isn't surprising enough to all you haters, she is also a publisher! Her top selling book Jhudoras Quests has provided exciting reading material for all. This book has received a Neopian Bronze Prize for faerie literature! Snuggle up late at night, and have a good read. Compliments of Jhudora! 6) She is a fashion statement- Purple and green are the colors of a winner! Not only do they always match, they always are in season! Looking at that beautiful green nail polish; you can only wonder where she came up with the great idea. Also, those swishy bangs she has are all the rage nowadays! Go into any training school and you will see all the neopet owners with swishy bangs. Guess you never knew it, but Jhudora started that trend! 5) She feeds the hungry- If you refer to the Neopedia article on Jhudora, you will see her stirring a large black cauldron. This is overflowing with a boiling green substance. I know what you're thinking: oh my! an evil concoction! Sorry, you are wrong. It is asparagus stew to feed hungry pets. Yes, asparagus stew is not the most tasty of things (knocks on wood), but this is still no reason to call her evil. See, you were all assuming things! Maybe you're the evil ones! You should follow her example, young ones. The lovely truth is she secretly helps make soup for the Soup Faerie. You didn't honestly think that the faerie of charity does it all on her own?! Only a true faerie sister would work so hard over a boiling stew of greens! 4) She is better looking than Dr. Sloth- If we are going to have someone to hate around the clock, they might as well be good looking. I did a quick poll on the help chat asking who is the best overall looking villain. The answers were anonymous, 3 out of 4 people prefer Jhudora. While a measly 1 out of 4 prefer Sloth. That says a lot, with how cool sloth looks in his cape. Jhudora's purple look has beaten green, yet again! 3) Without her, there would be no bottled dark faeries- Who do you think convinces all those faeries to go into the bottles? It can't be fun, being stuck there all day. Jhudora encourages those little dark faeries to bless those poor Neopians who are generous enough to set them free. I'm sure it is very cramped inside of them, even if you are a small faerie. 2) She encourages being on time!- We all know how punctuality is important. Whether you are completing a quest, working towards a goal, or have an important meeting with Lord Darigan himself, you must always be on time. One place we can learn this lesson is with Jhudora. If you are late to a quest, you are kindly told that it is not acceptable. This is a life lesson, that you must be on time. So no prize for you. She couldn't be any nicer helping us through life's twists and turns. 1) If she wasn't here, who would always better up Illusen?- Yes, you heard me correctly. Come on, I know I'm not the only one who gets sick of that goody two shoes Illusen. Also, what is up with her quest prizes? Cream cookies? That is the most pointless cheapo prize I have ever received for having to get an item worth a couple thousand. Also, *news flash* the whole green everything may have been in last year, but it's so out now (refer back to #4, purple faerie beats green sloth). Don't even get me started on what she does with those quest items... she gives them to the overlord meepits. Don't let her cheery disposition fool you; Illusen is the true definition of evil. So next time someone starts going on about Jhudora and how "evil" she is, point them towards this helpful directory. I am so glad I could put everyone's thoughts into words! Happy Jhudora Day!